"If you've seen the excellent documentary King of Kong, you'll know why we're doing this interview." While it nearly always manifests with a curious guffaw, both the media and the general public have nonetheless always displayed an unmistakable fascination with the world of classic arcade game competition. The historic Life magazine/Twin Galaxies photo shoot was probably the singular event that ushered in the relationship between the media and competitive video gaming, one that has been on friendly terms ever since. Billy Mitchell has been hovering somewhere in the realm of "household name" territory since 1982 for his video game exploits, and while he was quiet for many years, the news of his perfect Pac Man game in 1999 spread far and wide. The documentaries High Score (about William Carlton's struggle to achieve the marathon record on Missile Command), the upcoming Ecstasy of Order: The Tetris Masters, and Chasing Ghosts: Beyond The Arcade (just to name a few), show that competition over video games makes for surprisingly compelling filmmaking. The Donkey Kong world record chase in particular seems to have embedded itself as a perennial fixture in the media. 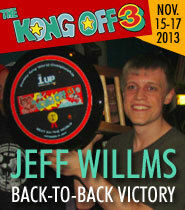 Obviously this has come in response to King of Kong's success and goodwill with the public, though the film can't get all the credit—after all, Steve Wiebe had already enjoyed a brief stint as a local celebrity when he broke the world record in 2003, and, of course, if there wasn't something inherently intriguing about the subject, the film wouldn't have been made in the first place. KoK certainly pushed things further, at any rate. 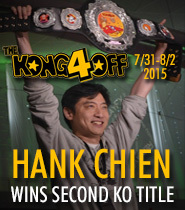 When Hank Chien toppled both Billy and Steve's scores in 2010, his feat was celebrated with massive international press coverage, a televised interview on Fox Business Channel, and even Dr. Kong—a well-received documentary short film. 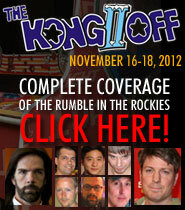 The question is, when will the media's love affair with competitive Donkey Kong come to its seemingly-overdue end? When will the topic be considered played out? Luckily, the subject has "paced itself," and a new headline crops up just often enough to remind people of the existence of this world, but not so often as to cause fatigue. My guess is that while a third documentary on the subject would be stretching things, at the very least, any future world record change-overs (or even attempts) will make as many headlines as they always have. There is (and has been) a cumulative effect at work here—the more attention this gets, the more of a legacy that forms, the more future attention it is assured. 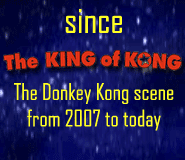 King of Kong has made the concept of elite-level Donkey Kong competition not only accessible to society at large, but has given people at least something of an enduring emotional investment in how things continue to play out: the film is effective in eliciting a rooting interest toward its two main characters. In other words, regardless of how silly it all is, it's now embedded in the cultural fabric. Donkey Kong will never be the NFL, or even pro wrestling, but the outside world has at least "shaken hands" with a few of the competitors and enjoyed some of their battles, and will remember the meeting fondly whenever the subject is brought up. 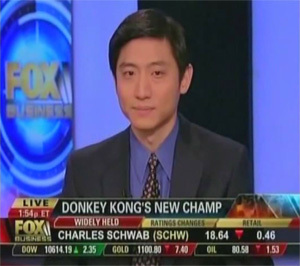 View Hank's Fox Business interview at the Donkey Blog YouTube channel.